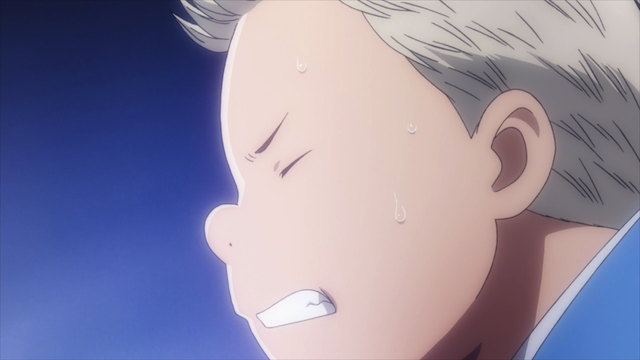 Episode 19 of Chihayafuru completes the Saitama prefectural tournament, which means two major victories and two major losses. In addition to the tension and emotional release of gameplay and determining the victors, this episode also covered some of the relationship management that is necessary when a group of players fights amongst themselves. All in all another very satisfying episode. Tsutomu Komano cracks under pressure. The continuation of Tsutomu and Kanade’s game was excellent. 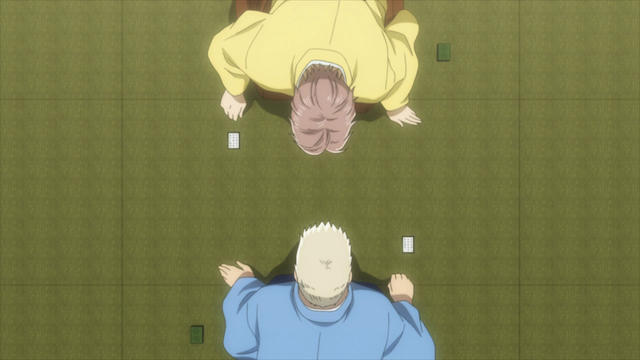 Though closely matched, Kanade’s flawless play left Tsutomu feeling the psychological pressure of his own mistakes. But even better we saw some growth in Tsutomu, who refused to give up, and struggled valiantly until the end, despite having the disadvantage. Furthermore, Chihaya saw exactly what she needed to in this match, as Tsutomu’s struggle to come from behind was very similar to the situation she had just found herself in. 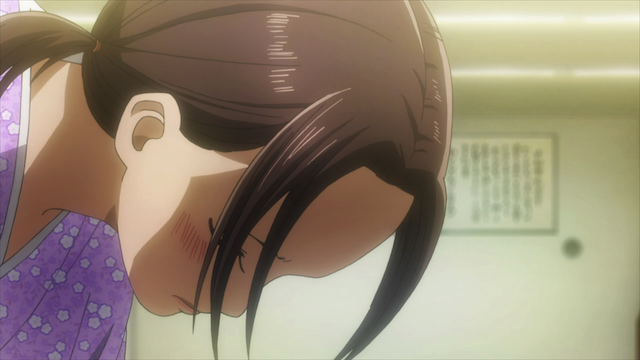 Now Chihaya realizes that to take her game to the next level, she can’t treat faults as irrelevant. She needs to make fewer faults otherwise she is only fighting at a disadvantage. Kanade Ooe, the modest champion. Another part of the D-Rank match resolution that I really liked was the way Tsutomu took the initiative to congratulate Kanade right away. I almost was hoping for a Tsutomu victory, because he seems to be the more delicate of the two, and I thought he might need the victory to bolster his confidence. When he lost I was worried he would get depressed or worse. When Kanade didn’t raise her head at first, I could imagine her wondering, “how do I look this guy in the eye?” Instead Tsutomu seemed to take genuine delight in Kanade’s victory, and prevented an awkward situation from arising. Taichi Mashima (top) versus Yuusei Nishida (bottom), each with one card left. With the Tsutomu V. Kanade battle decided, Chihaya turns her attention to the B-Rank match, and finds them each with a single card remaining. This section was brilliant. It was the perfect example of why Chihayafuru is an extremely well-written sports anime. First, we had already been exposed to the underlying mechanic (last week Chihaya had failed in a situation where a string of dead cards were read in a row), but the dead card mechanic that we were already familiar with was complicated by the very unusual situation of there being precisely two cards left on the mats. As by-standers remarked, the sensible thing to do here is to play defensively, which turns the situation into “Luck of the Draw”. Whoever’s card is read out first wins. Taichi, however refuses to accept 50-50, and he uses his memory and tenacity to fight Nishida head on. Essentially what Taichi would have been hoping for, I believe, is that by attacking, he could cause Nishida to fault on a dead card (which Taichi remembered had not yet been called). It was a very valiant effort, that relied on Taichi’s strength of memorization. Unfortunately for him, it didn’t succeed. Taichi Mashima: second place really just means that you lost. 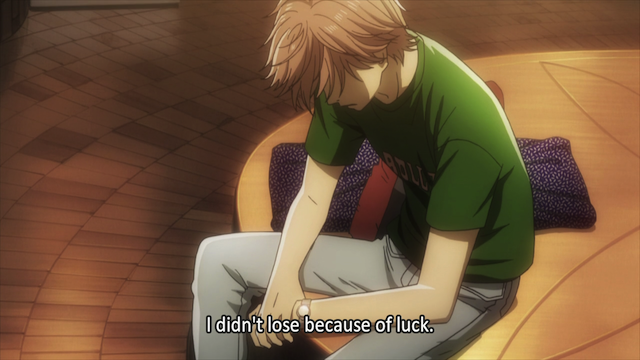 Taichi struggles against his instinctual desire to lash out at Nishida, but he acknowledges that his loss wasn’t Nishida’s fault, nor was it truly a matter of luck. His loss was the result of his own failure to grasp victory when there was still a chance. It may be easier to blame your problems on others, but it is much healthier to own them, because only then can you do something about them. Taichi’s acknowledgement of his own shortcomings is an entry point to improving his game. Yuusei Nishida, the newest A-Rank Karuta player. Again, a victory like this can cause awkwardness and tension within the team. This time it was Nishida that took the initiative to repair his relationship with Taichi. He did it by honestly praising Taichi for the job he had been doing as Karuta club president, and by making it clear that he wants to keep on playing Karuta with him. It was amusing that Chihaya overheard their conversation, and she seemed to at least temporarily take Nishida’s criticism of her to heart. It is very true that Taichi seeks to do what is right for the club, and treats everyone with respect, whereas Chihaya is utterly self-absorbed (or perhaps, merely Karuta-absorbed), so she doesn’t really pay attention to the effects of her words and actions on others. I think she could benefit by thinking a little more about the others in the club, so I hope this isn’t a passing phase. On the ride home, everyone is happily discussing Karuta, except for Taichi, who falls asleep. Chihaya thoughtfully gives him her shoulder to sleep on, instead of banging his head against the car window’s glass. I doubt this was a romantic gesture from her perspective, but I do think it was a compassionate one, and that is a nice side of her that we don’t always get to see. BTW, I misunderstood the advancement rules. I thought only one of the D-Rank tournament winners would be promoted, but both Tsutomu and Kanade get to move up to C-Rank. Congratulations! Geeze! This is an INTENSE show! Although I’m really enjoying the complex plot threads in “Moretsu Pirates,” THIS show is unparalleled in its character development and sheer storytelling. Also, I was wondering if the reason Tsutomu seemed to be struggling with himself so much was because — at some level — he didn’t want to hurt Kanade. And although he ended up giving it his best, if maybe that helped him to accept his defeat with the grace he did. Yes, this show is so well made. It will be a shame when it is over. Of the two shows, I definitely am more attached to the characters in this one (though that is a bit unfair, since they have had more time to develop). I have to agree that the giving it your all is important in a situation like that, because otherwise it would be hard to accept the outcome. 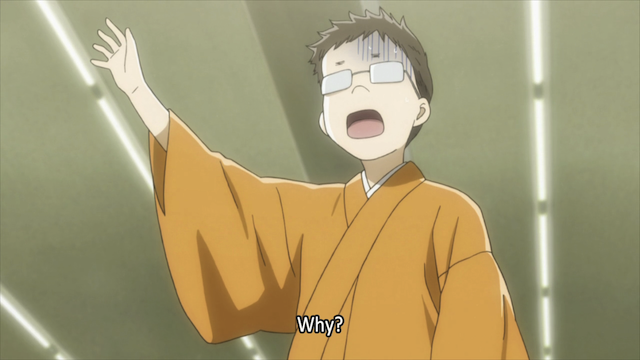 My memory seems to be bad recalling some of the previous episode of Chihayafuru so I may be incorrect when I say this but this was my favorite episode of the anime, even though the two characters I wanted to win did not win. The emotion, tension, and drama was all there. The pacing was excellent, no part of the episode felt like it passed by too quickly or dragged its feet. And the scenes afterward, especially the car ride home, were delightful in that it showed how strong everyone’s bonds are with each other. Kinda curious where the anime will go from here if they’ll do a team tournament or something along those lines. I agree. It was all there this episode. I don’t know where we go from here, but I will be fascinated to find out. Finally caught up with this wonderful series, I don’t know why I held off from doing so for so long, it’s now one of the shows that I’m really looking forward to each week alongside the likes of Danshi/Daily. And I’d have to admit that I wanted Tsutomu and Taichi to win as well, it would have given them both some nice development, Tsutomu would have won and Taichi would have gotten closer to competing with Arata. However in defeat they both managed to grow even more than they would have if they had won. All up resulting in some nice growth for their characters and team as a whole, they should all emerge stronger than they were before. 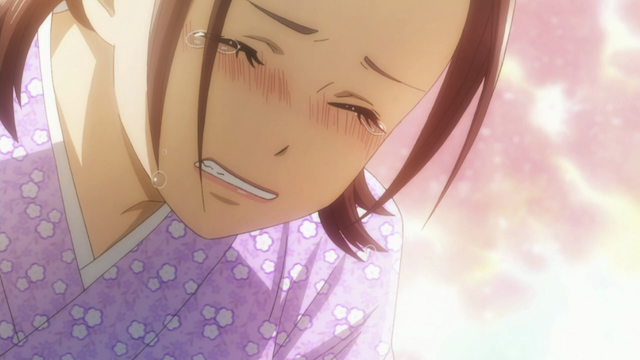 Yes, Chihayafuru is my favorite this season for sure. That was a pretty tough situation. No matter who lost it would have been disappointing for someone. At least Tsutomu can say he played well enough to advance in rank. Taichi’s loss was particularly harsh because it was a stepping stone to a stepping stone (he needed it to qualify for the qualifier just to get INTO the Meijin match). This puts him back at square one, and Arata must seem far away.